SRI provides comprehensive solutions for Facility Closure Management to industrial clients closing a unit, part or entire facility. An active facility operates under variety of permits from Federal, State and City. These includes, but not limited to Resource Conservation and Recovery Act (RCRA), the Clean Water Act (CWA), Clean Air Act (CAA), and Permit-By Role (PBR). 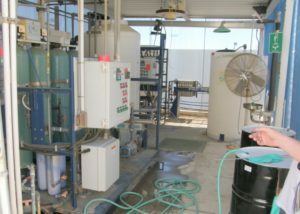 Upon facility closure some of these regulations continue to impact the facility and currently include formal procedures for RCRA closure, compliance with the CWA and modifications to existing permits under the CAA to remove the point source of emission. Facility Closure Management tasks requires a company with vast experience in equipment decommissioning and dismantling. SRI has a working relationship with number of agencies in California and is expert in meeting your budget and schedule for facility closure. 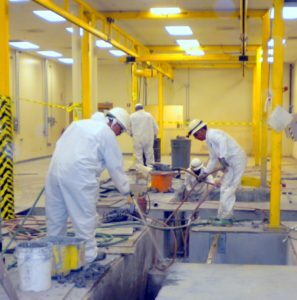 Decontamination of floor, walls, vaults, sumps, etc. Sampling from equipment, floors, walls, tanks and vaults. Companies such as Boeing and Kobe Precision, Inc. rely on experienced companies such as SRI to close their facility properly to eliminate liabilities associated with facility closure projects. The regulations governing a deactivated unit or facility can be complicated and have a tremendous impact on your company’s bottom line. Contact SRI and ask how we can help you manage your way through the maze of regulation to design and implement an appropriate solution.